On August 9th, Sydney beamed out strong support for Julian Assange with a live-to-air event: ‘THE GAGGING OF JULIAN ASSANGE’. The venue, with live audience, was Politics in the Pub at the Sydney Gaelic Club. Thanks goes to the #Unity4J movement and particularly its ‘Stream Team’, for their invaluable technical support. 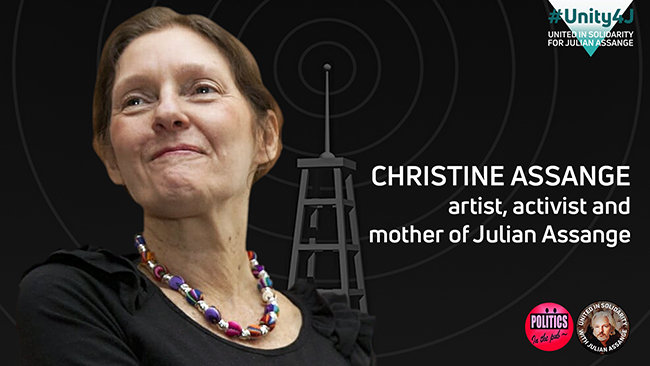 The remote guest speakers were Julian’s mother, Christine Assange, and the President of the New Zealand Internet Party, Suzie Dawson, who spoke to the audience live from Moscow. Here is the entire show, as broadcast on August 9th, with a direct link to Suzie Dawson’s talk. As viewers will see from the opening remarks by Vogan, there was a power failure (and internet lockout) while Christine’s interview was playing. Dawson focuses on the #Unity4J movement to save Julian – now 2700 people strong, and comprised of artists, writers, techs and speakers. She addresses the idea of bringing together people with different political opinions, who have one common aim, and how that’s been panning out. *** Christine suggests that UK govt did not extradite Gary McKinnon or @FreeLauriLove because they were UK citizens and the groundswell of outrage would have made it harder for them to extradite her son @JulianAssange. *** Christine believes the #Russiavape collusion narrative is designed to make it easier to charge Julian with espionage and avoid First Amendment protections. She notes how @SamAdamsAward US intel veterans have defended @JulianAssange and don’t believe Russia was @wikileaks source. This entry was posted in EDITORIAL, LIVING PROOF, NEWS and tagged Christine Assange, Ecuadorian Embassy, Julian Assange, Lenin Moreno, Wikileaks. Bookmark the permalink.